Shellie May's outfit is really cute, Gurgi! Back when "Take your Bear to Work" Day happened, I said that Duffy had gone all Lucy Ricardo on me. He wanted to be in the show I was currently directing. I tried to explain that The Rocky Horror Show was not appropriate for a bear. So he and Shellie May reinvented it as The Duffy Horror Show. That silly bear. This is quite possibly one of my favorite posts yet.... however the downside to that is that I now want to make columbia, magenta, and riff raff bears to bring with me back stage to work tomorrow. Thanks, Duffy is now using your post to convince me that he and Shellie May should be in the show. (The real problem is that Duffy can't sing very well--but, I don't want to hurt his feelings). There is one more pic that Duffy wants me to post tomorrow. There are also several others on my tumblr. Once you go down the road ofThe Duffy Horror Show​, it is hard to find an exit ramp. I hope Duffy can convince you to post more photos! I look forward to seeing them. So here is another attempt by Duffy to get into the show. This time it is as Frank "N" Duffy. Instead of being a Tim Curry clone, I'm afraid he came out as a cross between Bea Arthur and Ziggy Stardust. But as they say, once you catch the acting bug...you bug everyone until you get the part. 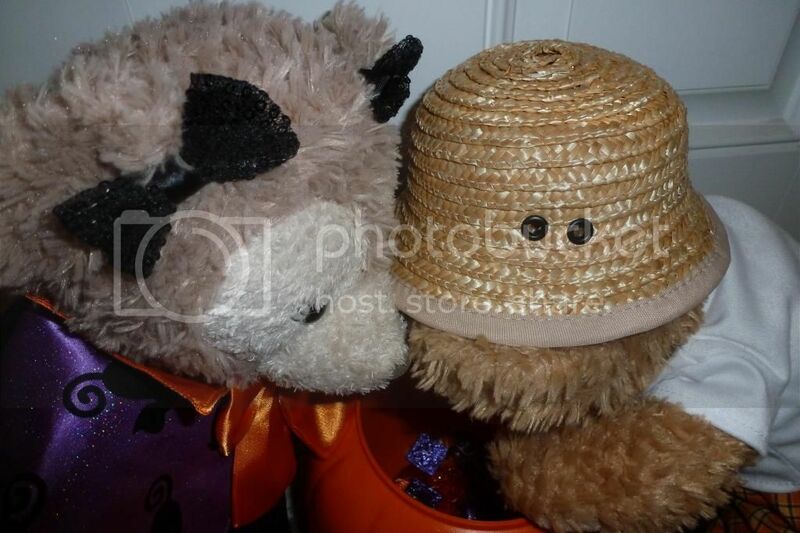 My bears LOVE Rocky Horror! We've already watched it a couple times this month and will watch it again tomorrow night as it's one of my Halloween traditions. Those photos are freaking hilarious and awesome. Impressive photos here! Gurgi, I especially like your bears' fashion sense and your amazing collection! Very Funny, Eeee-va! "A Waterbed! No, I am not!" I laughed my self silly. I love Duffy's expression in the end. It's priceless. Happy Halloween! 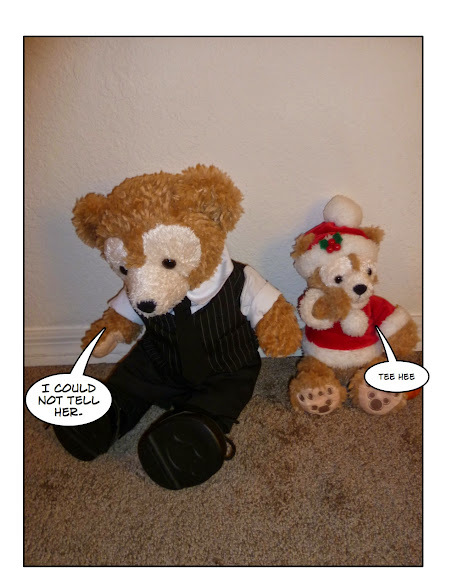 Duffy and Bearami send their thanks for giving them their comic reading fix. I love this, Eeee-va! So warming to see. I love the comic panels, Eeee-va! And I love the Duffy Horror Show! Fantastic stuff, guys. Ergh, Little Smiling Shellie is just TOO cute for words!!!!! So Duffy figured that if I wasn't impressed by his portrayal of the nebbish Brad Majors, then he was sure to win me over with his amazing physique by donning the gold spandex briefs of Rocky the titular character of the show. I'll just let the viewer make up their own mind.... Happy Halloween!! 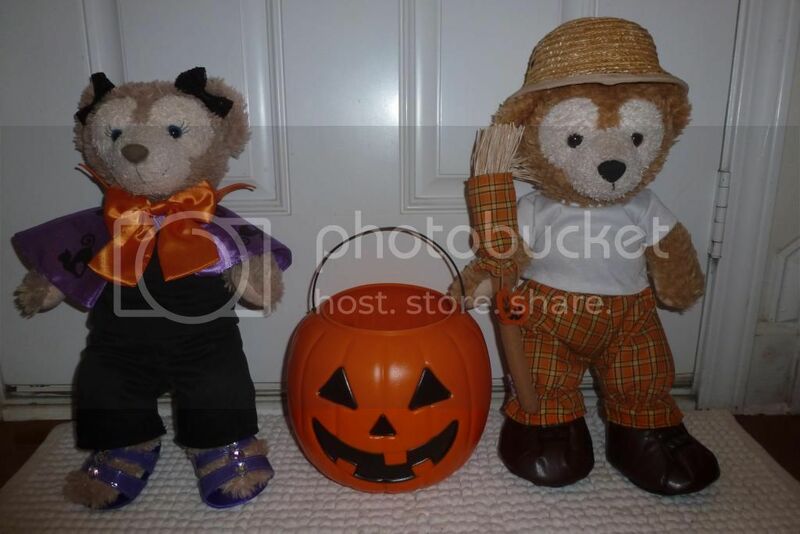 Duffy and Shellie May did not want to dress up as anything scary for Halloween. “Trick or treat. Well, we really won’t trick you, but we’re cute, so you’ll give us a treat anyway even without a threat, right?” they asked. I snorted when I saw the gold! Too funny. Oh, JillT, I would give your bears candy any day! Getoffyourduff, Rocky Horror Picture Show isn't my thing, but great effort! Shellie May and Duffy had a great time at TusCon, a small Arizona sci-fi/fantasy/horror convention. Shellie May wanted to hug Godzilla. Apparently Godzilla had already had his fill of humans for the day so no harm done. Mostly we went to panels and hung out. And spooky food in the Con Suite. And the traditional chili at the end of the convention. Very cute, Eeee-va. After seeing the Kaylee dress upthread I was going to mention that you should have a Jayne hat for your Duffy but I guess you already have one! Did you make that too or was it perhaps knitted by setavulos?